The curriculum for 4th grade history has been California History for as long as I can remember. 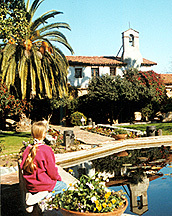 In 4th grade, I was taken on a field trip to the San Juan Capistrano Mission. I remember seeing the old ruins of the church, feeding the pigeons and exploring the hallways in the mission. It was a great learning experience. When my daughter reached 4th grade, I felt it was appropriate to have her research a mission in California and also visit it. We chose San Juan Capistrano mainly because it's the closest to where we live and it's also the one with which I'm the most familiar. The trip was a father/daughter trip that was enjoyed by both. In the late 1700's Spain became interested in exploiting it's holdings in California, especially since the Russians were moving further south into the same territories with forts around the San Francisco area of today. Spain was mostly interested in gold and also creating loyal subjects to the realm. Missionaries interested in the conversion of souls to Christianity helped make Spain's job of creating loyal subjects that much easier and it also established a stronger Spanish hold on the area. In 1769 the Franciscan Order of Priests was given the task of founding missions in Alta California for the purpose of "civilizing" the native population through education and ultimately making them colonists for Spain. The second purpose of the missions that the Franciscans were entrusted with was the prevention of further Russian expansion south. That spring, the first mission, San Diego de Alcala was established. The second mission was established in the Monterey Bay area and called Mission San Carlos Borromeo. The distance between the two missions was extremely large in that time period and there became a need to establish more missions in between about 1 day's travel apart. Mission San Juan Capistrano was established as part of this grand vision on November 1, 1776 by Father Junipero Serra. The grounds were laid out with a central plaza and a church on one of the corners of the buildings as seen in the picture above. The Great Stone Church was huge and built in the shape of a giant cross. Stables and soldiers barracks were also attached at the lower end of the buildings. The Great Stone Church was dedicated in 1806 but was only in operation for 6 years. In 1812, the church was destroyed by a powerful earthquake which hit during Sunday services. Approximately 40 people were buried alive in the rubble of the church as it caved in. The missions in Spain came to an abrubt end in 1833 with the separation of church and state within Mexico and San Juan Capistrano was abandoned. In the early 1900's, Father John O'Sullivan came to the area as part of an overall treatment for tuberculosis and became the driving force behind the restoration of the San Juan Capistrano mission. Living here for 20 years, he saw much of the restoration completed, including the erection of a statue of Father Junipero Serra in the opening courtyard of the mission. Father O'Sullivan is buried in the mission's graveyard. The bells of the church were placed in a wall overlooking this courtyard. The church itself was never fully restored, but there is scaffolding in place today as workers continue with restoration. This is more for a preservative effect than a complete restoration of the church. Future earthquakes could cause more damage, so there is seismic work being done today to make sure the rest of the church doesn't collapse in the next big earthquake. You can see the scaffolding of the old church in the background of the picture at right. The main courtyard of the mission has a beautiful fountain in the center and is quite picturesque. My daughter thought the entire experience was worthwhile. We went to the mission in late November, so we didn't get to see one of the star attractions of the missions - the swallows. Tradition has it that the swallows that live in and around the mission come home to roost on St. Joseph's day which is March 19th. Fewer and fewer of the swallows seem to come back each year which is probably due to the urbanization of southern Orange County. As a kid, I remember San Juan Capistrano as being out in the "boonies" of Orange County, a small little town where the mission was with not much else around. San Juan Capistrano today is just part of the overall urban sprawl we see everywhere in Southern California. One giant city seemingly stretches from San Diego in the south all the way past San Luis Obispo in north a distance of several hundred miles. I have been fortunate to visit 3 of the many missions in California. I would rate San Juan Capistrano in the middle of the three. I would like to visit others in the future, mainly because they are a rich part of our California heritage. I'll probably take my sons to different missions so we can learn a little bit more of this fascinating part of our state's history.